Gambrel Barn is the barn that has roof built with double slope on each side of the roof, with lower slope having steeper roof pitch than the upper slope. Gambrel Barns are also sometimes called Dutch Style Barns. 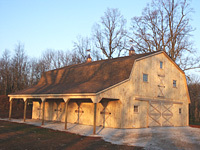 A Gambrel Barn can be built using any type of construction or framing technique. As long as the barn is built with a Gambrel style roof, it is called Gambrel Barn. Provides a different kind of look "Old Barn Look"
A Gambrel Barn is mostly constructed for the purpose of having extra attic space. E.g. 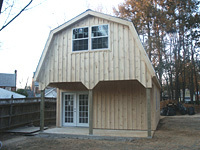 A horse barn with a Gambrel roof and full loft construction will provide significantly more space for hay storage. But, of course, there are some people that would build a Gambrel Barn simply for its looks. The look of the roof itself, on the Gambrel Barn may actually be slightly changed, depending on the roof pitch and length of rafters you use on both, upper & lower slopes. Even on a small building, you can have a Gambrel style roof (image on left is a good example). Since Gambrel style roof provides more storage space, it is advisable to build the loft floor a little heavier, so it could hold all the extra weight that may be added into this kind of roof. In addition, if the loft space will be used for hay storage, make sure the roof is sufficiently ventilated to help all the heat, generated by extra bales of hay, to escape freely. In addition to regular eave vents and the ridge vent, it might be a good idea to install couple of solar powered exhaust fans in your roof.